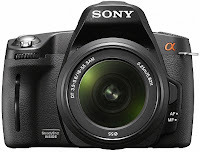 Sony DSLR Alpha 290 with a resolution of 14 megapixels which is also equipped with a LCD can be folded to make it easier to see the object image with the LCD and also has been equipped with image stabilizer on the camera body. This camera is suitable for beginners who want to try the sharpness of the SONY product image. ICHSAN PHOTOGRAPH. Theme images by mammuth. Powered by Blogger.